If you are looking to block out the sunrise each morning in an east or south facing bedroom, nothing compares to the combination of windows shutters and blackout blinds. Custom made to your windows, together these window furnishings will eliminate even the smallest of light gaps, for up to 99% blackout. And for a bespoke look, there are a number of styling options to help you complement your bedroom décor. Bedrooms often use more neutral and muted colours to create a relaxing environment where you can sleep easy. 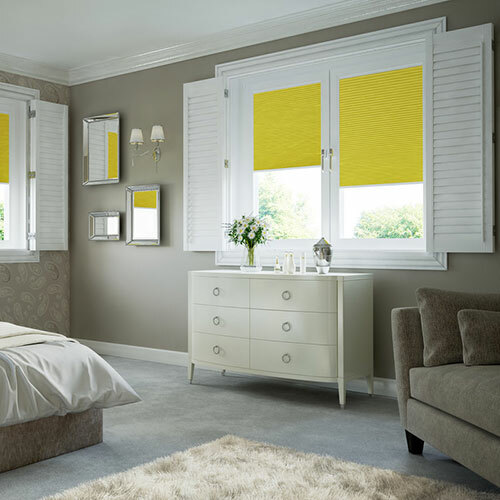 But as your blackout blinds will be hidden behind the shutters during the night, you have the option of matching them with a more dominant colour from the room, such as the bright yellow cushions pictured here. 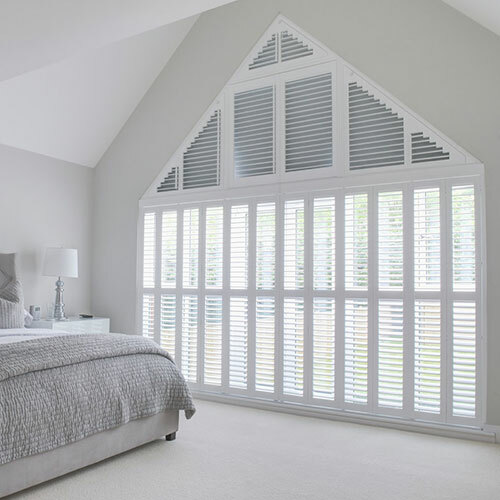 This provides a strong look that you can showcase throughout the day, then once the sun goes down, simply close the shutters to leave you with a more soothing shade such as an off white or soft grey. 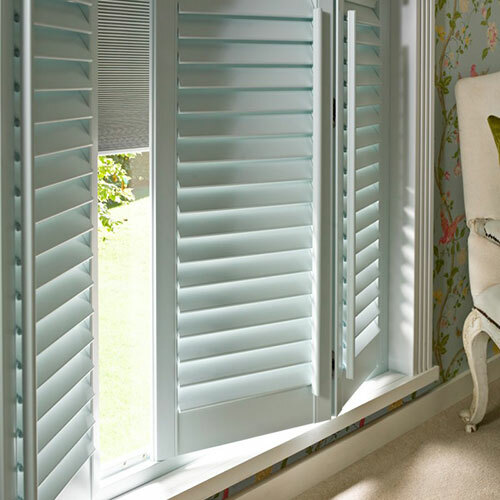 Window shutters will often come in a range of finishes. If you choose a bespoke finish, you will also have the option of colour matching your shutters to a shade or tone that already exists in your bedroom. While coloured shutters make a great complement, like the soft blue pictured here that is matched to the Laura Ashley wallpaper, it is worth considering what décor you are matching to and how often you may be looking to change it. If you are looking for a simple way to style your designs, why not colour match your shutters to the fabric you choose for your blackout blinds. A great option if you are not confident finding two colours that work together, this approach will allow you to use muted shades for both of your new window furnishings, elegantly blending into your decor. Alternatively, if you are looking to make a statement, choose a bold colour for both and create an energetic feature for your home. Depending on your window space, it may not be easy to open and close the blinds behind your shutters. Which is where a powered solution like our innovative PowerView® system can make controlling light an effortless experience. Using the smart app, Pebble remote® or even asking a personal assistant like Amazon Alexa, your electric blinds can instantly be opened each morning or closed as you go to bed, giving you the beauty of blackout whenever you need it. Or for a touch of true luxury, schedule what time you would like to wake up each morning and gently be woken by sunlight at a time that suits you.